Saturday 29th January 1916: Miss Edith Dickinson, of Heath Road, Leighton Buzzard has returned from Serbia where she was attached as a chauffeur orderly to a hospital organised by a Mrs Stobart. With her sister, Miss Hilda May Dickinson, she had been engaged in Red Cross work in Belgium during the German invasion. After her Serbian experiences she described what she went through in Belgium as a “mere detail”. The fall of Belgrade  was followed by several days of terrible hardships during which their hospital was inundated with maimed and wounded Serbians. Soldiers and civilians had fought side by side in the streets of the capital, with the nature of the wounds showing that there had been much hand-to-hand fighting. When the retreat began the wounded in the hospital were left in the charge of Serbian doctors and Austrian orderlies. She was among a party of around fifty British doctors, nurses and orderlies which left as an air raid by German planes was taking place. They caught a train for Salonika, but found that the rails had been torn up by the Bulgarians and were forced to abandon the train and proceed by motor car. After some time they had to leave the car and continue on foot. Waggons drawn by oxen containing stores also had to be abandoned leaving the party only with the clothes they wore and what they were able to carry. At first the leaders of the party planned to travel over the Albanian mountains to the Adriatic Sea but this proved impossible due to the hostility of the Albanians to the Serbians. 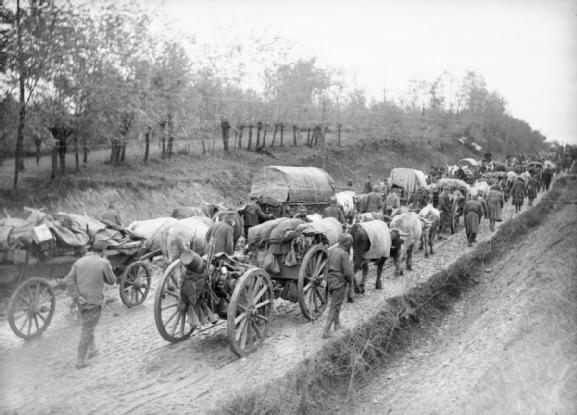 Their final route was an uneven, muddy track, along which they joined many thousands of refugees and the remains of the Serbian army. They passed numerous dead horses and cattle which had collapsed and been abandoned by refugees earlier in the retreat. The sight of dead bodies of human beings, half covered by snow, was all too frequent. The journey over the mountains lasted for ten days, while blizzards and rain storms beat down on the party. At night tents were pitched into the snow and the exhausted refugees flung themselves down to sleep. The track was too dangerous to travel by night, in places being little more than a narrow ledge on the mountain side. On more than one occasion vehicles went over the edge, throwing out those inside and either killing or injuring them. One of the nurses, a Scottish lady, was killed in this way. They had only a very limited food supply, with rations doled out in ever smaller quantities. The Bulgarian and Austrian prisoners accompanying the party were fed as far as possible but many died of starvation. The hospital party was better off than most of the refugees; although they had only black bread and maize bread, they fortunately had some hospital stores, including Bovril and condensed milk. High in the mountains the cold was intense, and broken bridges meant they often had to wade through streams. Their clothes froze as stiff as boards on the wearers. The track was often knee deep in mud and slush in places, and hard and slippery with frost in others. Some of the nurses were wearing light summer dresses and had shoes totally unfit for the journey. Miss Dickinson was fortunate in that she had breeches and top boots. Once the party reached the Adriatic side of the mountains it became warmer and their sufferings were less. They sailed across the lake of Scutari and after a further two days walk they reached San Giovanni di Medua from where they crossed to Brindisi in a small Italian boat. At San Giovanni they were told the Austrian army was on the move and that unless they took this ship they might not be able to get away; in the light of this they decided to risk the journey, although 300 people were packed onto a small vessel in heavy seas. When they reached Brindisi they were a sorry spectacle and had difficulty convincing the authorities to allow them to land. Miss Dickinson says “we looked simply wretched. Most of us were ragged, muddy and dirty, not having been in a bath for weeks. On top of this we were distressingly thin, and our feet were showing through our boots”. From Brindisi the party were able to take the train first to Paris and then to Le Havre and England.